Yes, this is me and my brother. From the back, to conceal our identities, obviously. Make way for memoir! Make way for memoir! Posted to the Teen Ink website August 1st, 2012. And even featured on the front page of the entire Nonfiction section! I have a screencap as proof. With the little VIP sticker next to my name, no less! A picture; a moment, frozen in time, enhanced by the wonders of photo manipulation. 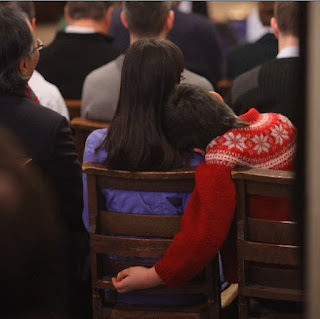 A brother and a sister—not far apart in age, perhaps they're twins?—sitting next to each other in church, shown from the back. The girl is sitting up, attentive to the sermon, or at least pretending to be, in a corduroy periwinkle dress. The boy's head with its mop of unruly dark brown hair is leaning on his sister's shoulder, his arm dangling down from behind. Everything else—the stony, gothic walls of the chapel, the candles illuminating the darkness, whatever words of the preacher were hanging in the air—is blurred together, fading into the background, thrown into sharp contrast with the too-thin, too-clear lines that make up the faces and bodies of the two subjects of the piece. The frozen moment, the captured fleeting second, is a perfect picture of love and harmony and sweetness between members of a family, a tangible yet symbolic image of the bonds formed between us and God and each other. Which is amusing, given that I don't remember it that way. What I remember is the heat, radiating from Nate's feverish body. I remember the heat and the sickness and his limp, half-awake body pressing against mine, leaning against me. I remember his face, the face of a child with its puffed-up lips resting against each other, not moving into a scowl nor a smile, the face of neither a demon nor an angel. I remember the thick stillness of the air and the candlelight flickering up and down and the world gone still for one captured moment. It's not the sharp perfection of crystallized love that makes up the photograph; it is hot and intense and muggy and so many other things that are just too hard to capture. Looking back on it now, I can name it as a rare, fleeting time when I know that I am my brother's keeper, like it or not. Such a beautiful little vignette captured in film and in writing. Amanda, you have a gift for words. Hmmmm, might ministry be in your future? I have considered ministry... though, you know, I'm only in high school, so lots of things could change... Thank you for reading! another song comes to mind here - may be more from the gentleman pictured to the left's generation - that captures the relationship acknowledged by the end, "lean on me." Thank you! I am familiar with "Lean On Me"--"You just call on me, brother, if you need a hand... we all need somebody to lean on..."
"And even featured on the front page of the entire Nonfiction section!" Love this piece. I especially enjoyed how it starts off with a (slightly) omniscient narrator and no names, and then shifts more to you and is more... focused? Very beautiful style... and I must say, that picture is /adorable/. Favorite lines, probably: "Which is amusing, given that I don't remember it that way." and "It's not the sharp perfection of crystallized love that makes up the photograph; it is hot and intense and muggy and so many other things that are just too hard to capture." Good contrast of the two ways given of capturing a "Moment".